US builder Chris-Craft announced plans to debuts its latest runabout yacht, the Capri 21, at the Cannes Yacht Show in September. At 6.45m, the Capri 21 is ideally sized as a superyacht tender. The classically styled yacht takes design cues from Chris-Craft's vertical bow models of the 1930s. The Capri 21 has the 'vertical bow' profile with a stainless steel bow plate, and it also features the sloped tumblehome that is a trademark of Chris-Craft's design. 'The Capri 21 speaks to the past, but the design appeal is forward thinking and unmistakably Chris-Craft, says Stephen Julius, Chris-Craft chairman. 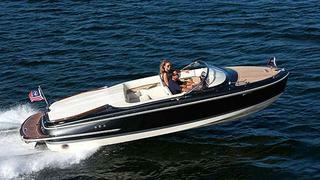 The Capri 21 debuting in Cannes will show off a new graphite metallic paint colour that Chris-Craft is now offering. The boat also features Chris-Craft's new cockpit for its 2014 models with restyled seats, fabric and diamond-pattern upholstery. This is the second of two vertical-bow boats Christ-Craft has launched this year, the first being a bow-rider Carina 21 that debuted at the 2013 Miami International Boat Show. Also debuting in Cannes is the Launch 32, and Chris-Craft will also display its Corsair 32 and Corsair 28 models alongside the new Capri 21.